Where to start…yes, this is a raw egg. It’s sitting on a pile of beads on my bed in The Roosevelt New Orléans. 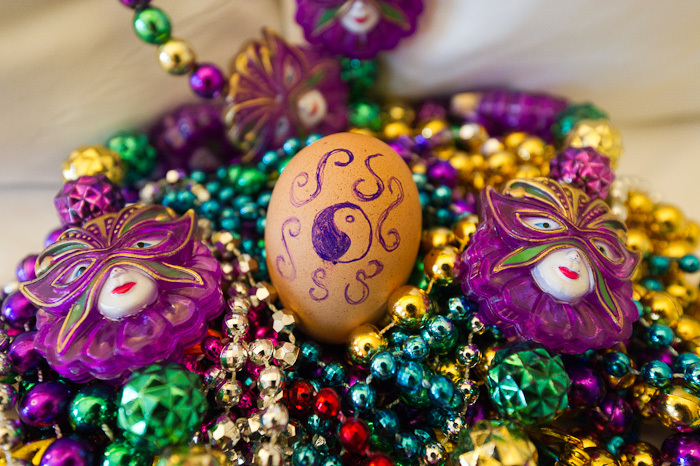 I’m pretty sure not many raw eggs have spent almost a week hanging out in a Waldorf Astoria Hotel, soaking in the atmosphere of The Big Easy and wearing Mardi Gras beads. My egg is certainly one-in-a-million. As you might imagine, there is a story here. After nearly five years of Tae Kwon Do study, my black belt exam happened to fall on December 10, 2011, just two days after I return home from the United States Hunter Jumper Association Annual Meeting in New Orléans. Part of my test is to care for a raw egg for a week, as if it’s my child, keeping it from harm and attending to it so that I can present it unbroken to my Tae Kwon Do master during the test. I debated bringing the egg to New Orléans and did receive an exemption, but in the end I really wanted to fulfill all the requirements of my test to truly earn my belt. Thankfully, my egg survived New Orléans and two trips through airport security. Now, I just have to keep him (our hotel roommates Ginny and Jo-Ann deemed him a him) safe from harm one more day…and if he’s as tired as I am from this past week, we’ll both simply spend the day recovering at home. Wow quite an accomplishment protect “him” from airport security/handling! He made it through National Airport without much notice, but he got a good look in New Orleans! I had my story all prepared, but I didn’t have to give it. In hindsight, I’m thinking he was less than 3 ounces so perhaps that kept him safe!